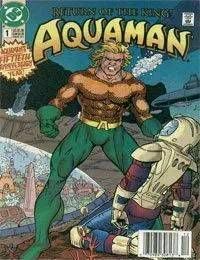 Aquaman has lost everything he holds dear--his wife, his child, his kingdom--and is now an obsessed man, driven by non-stop super-heroics as the King of the Seven Seas. Hes a man who keeps his pain inside, allowing his anger and sorrow to emerge in violent action!<br />Poseidonis is under attack and nobody knows what is happening. The King knows they are in need of help and nobody knows where Aquaman is. They send messengers in all directions looking for him to come and help them.